Does your family still eat cereal? And we also use it as a crunchy snack that is healthier than chips. But with Costco bringing bigger boxes and taking up space, I got a little frustrated. One night before garbage/recycling day, I was getting out as much “trash” and “disorganization” as I could to the curb. There was a tiny bit of cereal left in a huge box. I thought in one more day, I’m going to have to keep this recycling around the house for another 7-9 days?! No thank you! Take the bag out. Tear off one side of the boxes top labels. Then fold down bag (to keep fresh of course), and clip the label onto the bag. This way things are still labelled and there’s no extra work: I don’t need to make labels off Pinterest – this works and is recognizable just as well as the box itself. The kids even find what they are looking for. 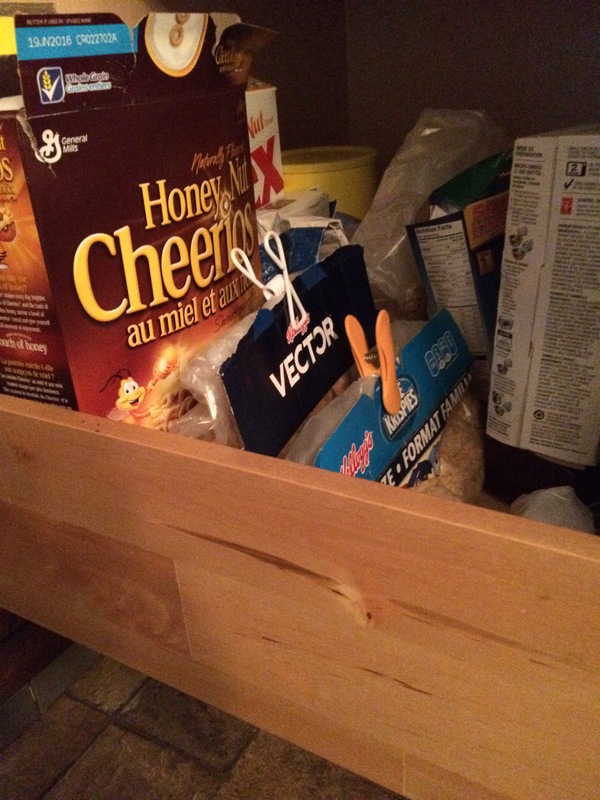 Plus I never discover an empty cereal box that’s been taking up space in the cupboard for the last month (darn kids…. or roommate…. Or spouse!). I hope it is a practical solution for you to use and share. The better things are at home, the better life seems to get. Published by Sandra Venneri, B.Sc., P.H.Ec. B.Sc. (Hon) Nutritional & Nutraceutical Sciences, P.H.Ec. Twitter @nutritionbites8 Instagram @nutritionbites Facebook NutritionBitesCanada Pinterest @nutritionbites Blog On WordPress http://nutritionbites88.wordpress.com Website www.nutritionbites.ca	View all posts by Sandra Venneri, B.Sc., P.H.Ec.